Matthew F. Sheehan's, in business since 1907, has a large selection of bishop's rings available including this beautiful ring, item number 4371. A large 10x12mm synthetic amethyst surround by an etched rope on the bezel highlights this ring. You can replace the amethyst with a ruby for an additional cost. Rings are available in gold-plated sterling silver or 14 karat gold. We would like to give you the best price possible. Bishop's rings signify the bishop's symbolic marriage to the church or Christ and have been part of the bishop's insignia since the early 7th Century. Please feel free to give is a call if you have any questions about these rings or if you need to confirm the availability of a ring size. 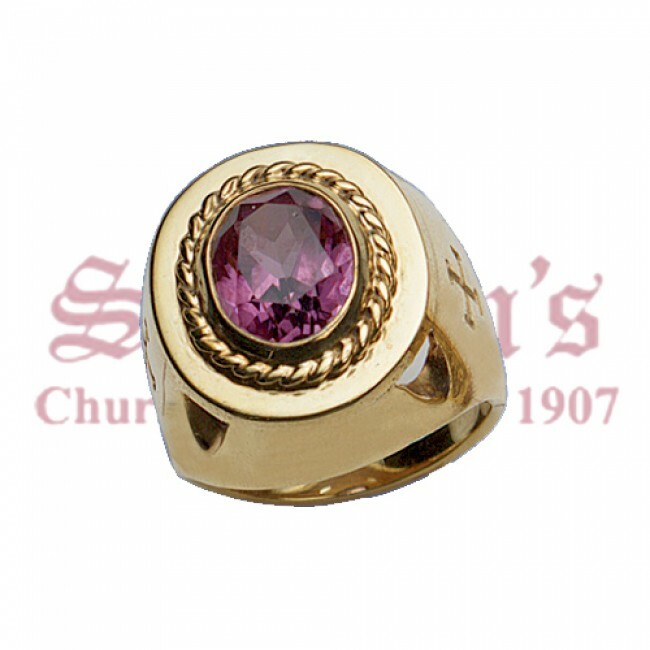 Please call us for a price quote on the 14 karat gold ring before ordering due to the fluctuation in the price of gold.